I thought I’d try a new sauce for kabobs. I intended this for grilled salmon, but ended up making shrimp kabobs. A little experiment if you will! Plus, my first harvest from the garden! 25 shrimp ($2.50) Using up the rest of the bag from when I made Shrimp Scampi! Fresh Spinach from the Garden!!!! We’ll call it free! Thaw shrimp. Cut green pepper and onion into skewer size pieces. 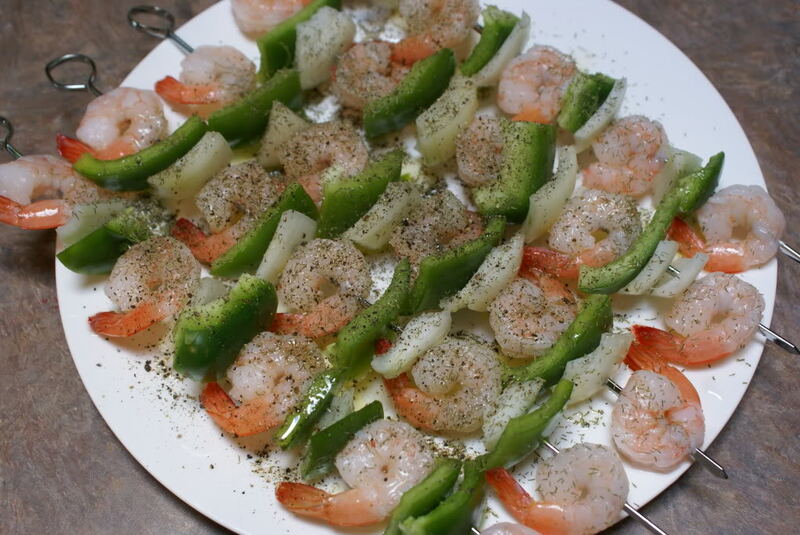 Place shrimp, green pepper, and onion on skewers. Brush with olive oil and sprinkle with a few dashes of dill. Grill for 5-6 minutes on each side, until cooked through. 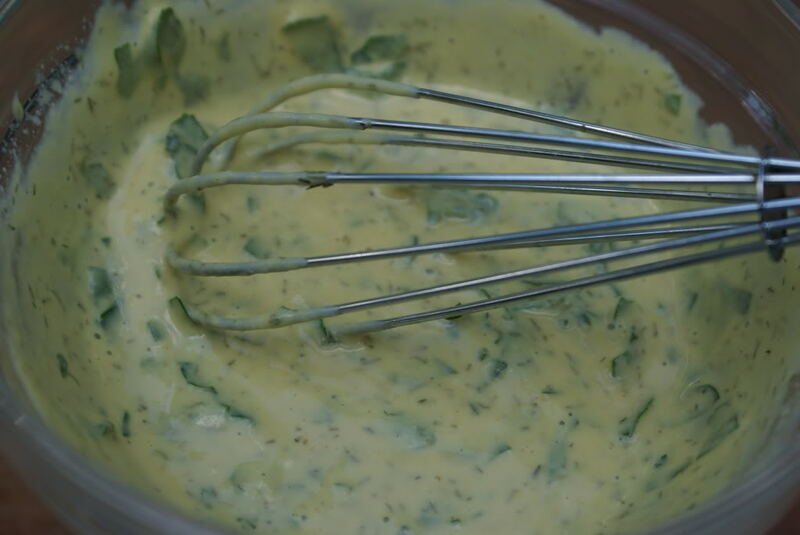 In small bowl, whisk dijon mustard, milk and dill until creamy. Dip shrimp, peppers and onions into sauce. In medium saucepan, bring 1 cup of rice in 2 1/2 cups of water to boil. Reduce heat and simmer for 20 minutes, until brown rice is cooked through. Fluff with fork before serving. Soak and wash spinach leaves. Steam in stovetop steamer for 4-5 minutes. 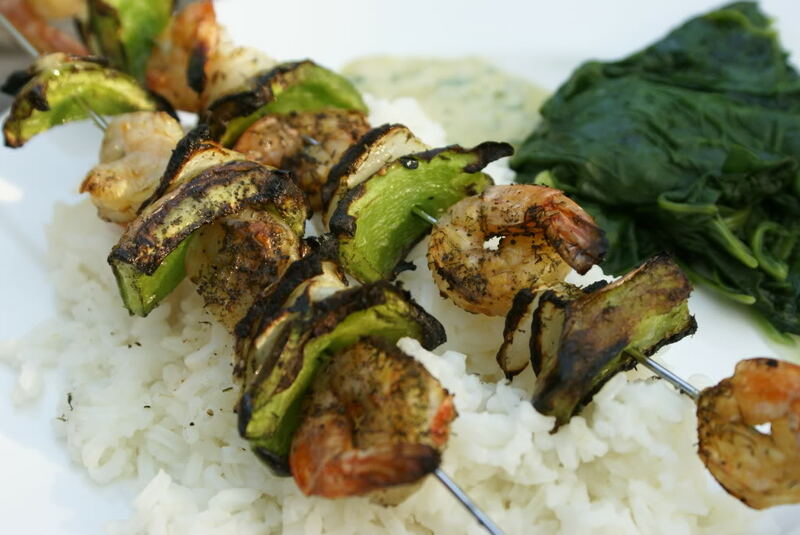 Serve Shrimp Kabobs with Creamy Dill Sauce, Rice and Steamed Spinach. ***I must say the sauce was delicious! It was zippy like cocktail sauce, but with a dijon flavor. Yum! Your shrimp look like they were already cooked. Did they come out rubbery? I like the idea and the sauce sounds tasty! They were cooked…one of the skewers was a bit overdone, but the rest were good. The boys gobbled them up! This looks awesome & I will definitely be trying this one! Question… where did you use the parsley? As a garnish on the rice or within the dipping sauce? Thanks so much – I love your blog/website!! I made this over the weekend and we LOVED it! I added some chopped squash and zucchini to the kabobs though. You’re recipes are awesome! !